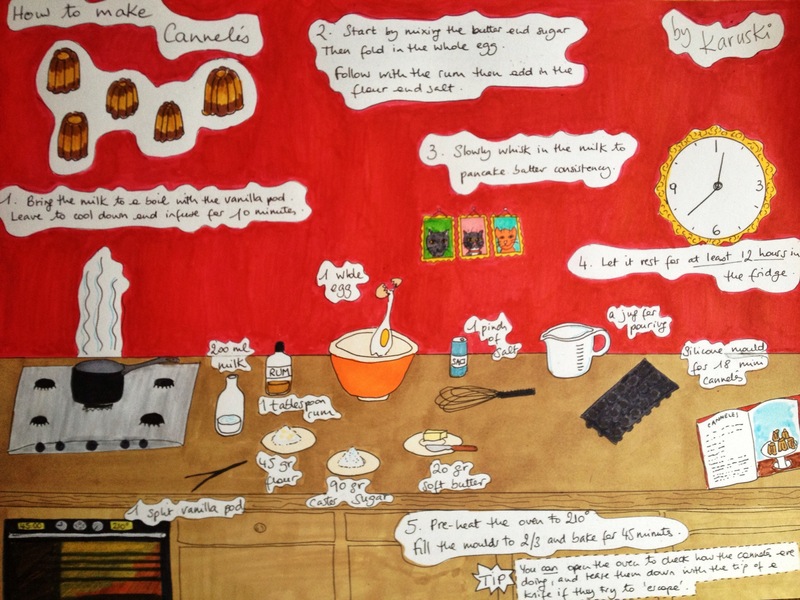 Cannelé recipe – illustrated if you please! So drawing is clearly fun. But so is baking. So I have set up a cake shop. It’s called ‘Choux la la!’ and it’s super pretty and magical and it doesn’t make you fat at all. Only problem is, it only exists in my head for now. But you can see what cake dreams are made of on my Facebook Choux la la page and on one of my many Pinterest boards. 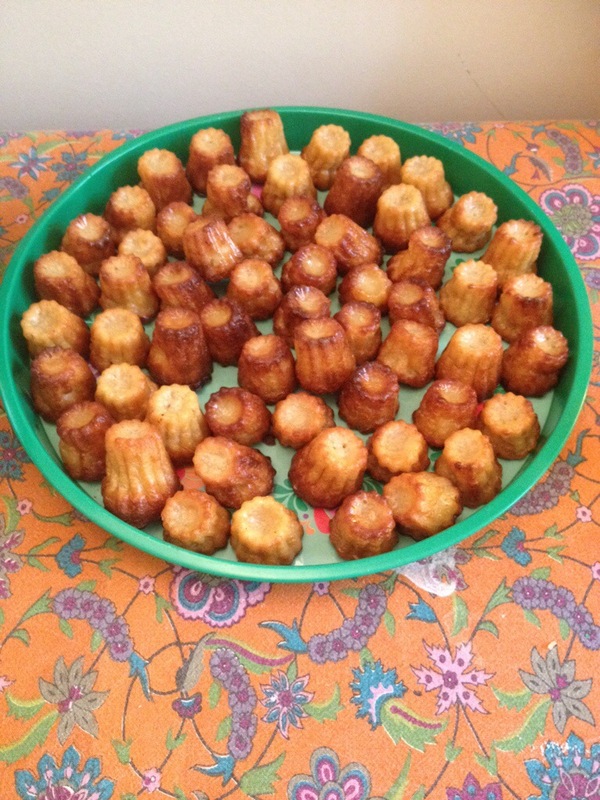 Below is my first illustrated cake recipe for Cannelés. I believe that baking is NOT that tricky if someone shows you. So there. These are incredibly delicious, but you can’t really find them in the UK (it’s a specialty from Bordeaux where I’m not from). Truth is, they are infinitely better home-made. So have a go. Go on. Then tell me about it. You will need to invest in the moulds, but the silicon ones are more than perfectly adequate, and there’s nothing to stop anyone using them with other cake types or even jellies! I like making mini ones rather than big ones, they are more dainty and fun. Less guilt inducing too! And here’s the recipe again for you – the batter is actually very similar to pancake mix, very liquid, but the baking in the special mould is what creates these little marvels. They taste very custardy, and not unlike other major favourite, pasteis de nata. Most important, you must must must rest the batter – there is a lot of controversy about how long, but I generally go for 12 hours – the only explanation I could find is that it helps stabilise the batter – don’t let it rest and your cannele mix might decide to escape! So basically, if you want to have a go, you will have to start the day before. It doesn’t matter if the batter stays in the fridge longer (to a couple of days is fine!). The baking bit is also subject to much debate: the main goal is to have an outer shell nicely caramelised and crunchy, and the inside still soft, just beyond gooey. This might take a little adjusting depending on your oven – but my technique is to go for a pretty hot oven. Boil your milk with the vanilla. Leave it to cool for 10 minutes. Meanwhile, mix the butter and sugar, then the whole egg. Once incorporated, and the rum and mix again. Then it’s the flour and salt. It will look like quite a dense paste. After this, start pouring the milk in a regular small stream with a whisk. The batter will foam a bit but it doesn’t matter. LEAVE THE BATTER TO REST FOR 12 HOURS! On the next day, pre-heat your oven at 210 degrees, fill your moulds to 2/3 (no need to butter silicon moulds first, and they will grow a bit! ), then in the oven for 45 minutes.